WINEP and Wikistrat analysts predict that Assad and his army will “fall”, “crumble”, or “break”. I have argued the opposite in “Creating a Syrian Swamp: Assad’s ‘Plan B’“. A likely outcome of the Syrian struggle is that Assad and his army will not break; rather, they will likely retreat to the coastal region, where Alawite and loyal troops have a social base. They would be very hard to destroy on their home base, especially if foreign allies continue to support them with weapons and money. Should this happen, Syria’s civil war could end more like Lebanon’s — with a stalemate — rather than like Libya’s — with the death of the dictator and destruction of his military. If Sunni Arab rebels manage to unify or if foreign powers intervene directly, the survival of Assad’s military is unlikely. In order to survive, Assad and his Alawite generals will struggle to turn Syria into Lebanon – a fractured nation, where no one community can rule. He may lose Syria, but could still remain a player, and his Alawite minority will not be destroyed. Today, Junblat, Geagea, Gemayyal, Franjia and other warlords are respected members of parliament and society. All might have been taken to the international court and charged with crimes against humanity two decades ago. After all, somewhere between 100,000 to 150,000 Lebanese were killed out of a population of three million during the civil war. When the Lebanese came to terms with the fact that no one camp could impose its rule over the others, they had no choice but to bury the hatchet and move forward. If Assad surrenders, hundreds of regime leaders will be executed or tried for crimes against their fellow countrymen. The broader Alawite community fears the possibility of aimless retribution. To avoid this, Assad is likely to pursue the Lebanon option: turn Syria into a swamp and create chaos out of Syria’s sects and factions. It is a strategy of playing upon divisions to sow chaos. Already the Syrian Army has largely been transformed into an Alawite militia. If Assad must withdraw from Damascus, he will have nowhere to fall back on but Latakia and the coastal mountains. I have argued that the Alawite region cannot be turned into an independent state, but it does provide Assad and the remnants of the Syrian Army a social base. Just as Lebanon’s Maronites did not create an independent state in the Lebanon Mountains, they did use it to deny Muslim forces undivided supremacy over Lebanon. The Syrian opposition will have difficulty defeating Assad’s army. This is certainly true if opposition forces remain as fragmented as they are today. Assad is gambling on his enemies being unable to unite. He is working assiduously to turn Syria into a swamp in order to save what he can of his power and the lives of those around him. If Assad is successful in this ambition, there will be no clear endgame to the fighting in Syria. Syria’s Baathist regime cannot survive. It is already collapsing. Most state institutions are no longer functioning. Order has broken down in many parts of the country. New authorities are springing up as the old disappear. But Assad’s army in its transformed state is likely to remain a powerful force. I was just reading your latest post, and I think that WINEP’s assessment shows how out of touch they are with the Syrian mosaic. My husband, [a Sunni Damascene] has Alawi family friends, and one of them has just joined an Alawi militia. According to my husband’s cousin, who works for Rami Makhlouf, this militia is being funded by Makhlouf, and each volunteer gets paid money and get training and weapons. Of course, this person is in Lattakia, which supports your claim that they will probably unify in the coastal region. I am just beginning to realize how sectarian characterizations are just the surface of everything. Yes, my husband’s friend is Alawi, but they had grown up together. They had known each other since they were babies. We were talking about this the other day. What if my husband had stayed behind and joined the Free Syrian Army? What if they ended up having to fight each other? How horrible would that be, for brothers to kill each other? My husband is not the only one who is suffering from these thoughts. There are so many of my friends who have had dear Alawi friends, and they had to watch those friends become soldiers who kill their fellow Syrians. It’s not easy, especially when those friends die. You just don’t know how to feel. Your question is a good one, if the Assad military loses Damascus how will it be able to sustain itself as a viable fighting force with nothing but the miniscule economy of the Alawi Mountains to sustain it? The second part of your question is how can the Alawi 12% of the population withstand the 70% Sunni Arabs? You are correct to ask these questions. Assad cannot afford such a fighting force without the financing that comes from owning Syria. The only way he can sustain his military without owning Syria is if Iran chooses to fund him as it does Hizbullah, which it might well do. Question 2: Assad and the Alawis cannot defend against the 70% Sunni Arabs. You are right but that statement presupposes that “the Sunni Arabs” will fight as one and will unify. There is no sign that they will. Perhaps they will some day, but that day is still too far away to predict its arrival with any certainty. I certainly cannot predict the future either, but I play this game because so many analysts remain convinced that Assad and his army will crumble that it seems reasonable to question their assumptions. As of yet, I do not see a force that can destroy or best Assad’s Army. Damascus and Aleppo are increasingly becoming ungovernable. As the regime contracts and eventually crumbles, opposition fighters on the ground are poised to determine the course of Syrian politics. … Particularly in northern Lebanon, tensions between Sunnis and Shiites are palpable. Conversations with fighters in these areas exhibit a more sectarian hue than ever before, with individuals freely admitting that they are fighting not just Assad, but also Shiites from Iran, Hizballah, and even Iraq. …. Looking ahead, Assad’s regime will fall when his forces break — and the Syrian army is on its way to breaking. The government is still determined to hold the entire country, and this over-commitment is bound to place unbearable stress on its capabilities. In the meantime, unfortunately, the regime is consciously inflicting causalities on civilians in an effort to break the connection between the populace and the armed opposition. If it succeeds in that effort, even if only on a local level, it will have made an important gain. ALEPPO, Syria — Two months into the battle for Syria’s second largest city, the airstrikes have become a part of daily life. Sometimes they are deadly accurate, taking out the rebels for whom they are intended. Just as often, they seem to miss. A rebel headquarters in a former police station in the northeastern neighborhood of Hanano stands as testament to this. Though its windows are all broken, it has been missed at least four times, the intended strikes landing in a nearby park, an empty lot and destroying a five-story apartment building a full block away. The battle for Aleppo that began with a rebel offensive in mid-July has settled into a stalemate. The rebels here control largely the same neighborhoods they took in the initial offensive. But there is something different here – a distinctly religious tone that this reporter hadn’t heard elsewhere in more than seven months covering Syria’s rebellion…..
“This is not a revolution, it’s a jihad,” shouted one man, angry, as he stood near the rubble of the apartment building mentioned above. Behind him, men worked with a bulldozer, trying to reach people they believed were still alive under the rubble…. Liwa Tawhid, one of the largest groups fighting here, had even made contingencies for policing rebel controlled neighborhoods and laid out plans to set up schools. Their plan for schooling includes religious instruction, and their council for making decisions about the fate of prisoners includes an expert in Islamic law. At a mosque being used as a base for fighters in another neighborhood, a sign warning civilians against entering was another sign of the religious drift. The sign referred to the men inside as “mujahidin,” which translates as holy warriors, as opposed to “thowar,” which means revolutionaries. Last Tuesday, at another rebel base, members of Ahrar al Sham, a group whose members describe themselves as Salafis, followers of a conservative strain of Islam some of whose followers also are thought behind last week’s attacks on U.S. diplomatic facilities in Egypt, Libya and elsewhere, handed out leaflets delineating the difference between mujahids and other rebels. It used the pejorative term “shabiha” – a Syrian word that usually refers to pro-government militiamen accused of carrying out some of the war’s worst atrocities – to refer to non-mujahids. The mujahid “Uses his weapon to support the oppressed people and their rights in a way that God accepts and nothing else,” the document continued….. In Aleppo, Jabhat al Nusra, another Salafi group that has been known primarily for claiming bombings against government targets, is an actual fighting force here, with an identifiable base of operations from which it carries out guerrilla strikes. Members of the group declined interviews. But they know what their image is outside Syria. “They say in the West we are Al Qaida,” one Jabhat fighter scoffed, meaning it as a denial. Mohammad Ali Jafari, the commander of the Revolutionary Guard, said that his forces were playing only an “intellectual and advisory” role, but that they will offer military assistance in the event of external intervention. “We are proud to defend Syria, which constitutes a resistance to the Zionist entity,” Jafari told reporters in Tehran. Sept. 12 (Telegraph) — Christian communities in Aleppo have taken up arms and formed their own militias for the first time, the Daily Telegraph can disclose. ….Seeing little hope of change many Christians have already joined the hundreds of thousands who have fled the country. The UN High Commission for Refugees said 253,000 Syrians were now registered with them. Many Christians say they hold little hope of returning. The Daily Telegraph on September 10th ran an article titled “Syria: Christians take up arms for first time”. But the article talks mainly about Aleppo Christians. It is not the first time for Syrian Christians. It is the first time for Aleppo Christians. I have always said that if the Assyrians in Iraq had 1,000 fighters in Baghdad and 1,000 fighters in Mosul, none of the bad things would have happened to them and other Christians. The Assyrian tribes there were disarmed in 1933. In Baghdad and Mosul, the Christians are spread among Muslims in almost every neighborhood. This would have been difficult to accomplish. Aleppo is different. The Christians in Aleppo inhabit 10 contiguous neighborhoods, all in the north half of Aleppo, 5 dominated completely and 5 have Christian majorities in them. The daily Telegraph mentions 150 Christian fighters in Aleppo. We need 1,500…..
Video: The sorrows of Syria – Michael Provence does a good job of giving an overview of the revolution so far. DARIYA, Syria — As he hid from soldiers in a field next to his neighborhood, a young man watched as a cat wandered down a street. Suddenly, it was shot dead. That’s when Zuhair noticed the sniper on a nearby roof.But a father and son walking along the street didn’t see the gunman, Zuhair said. The sniper lowered his head and peered through his scope.He shot the boy first. As the man tried to grab his son, who looked to be about 10, he was shot as well.The two are among a reported 700 victims of snipers, shelling and summary executions, most of them men, since forces loyal to President Bashar Assad stormed the Damascus suburb of Dariya in late August, one in a growing list of Syrian towns and villages that briefly enter the world’s spotlight, only to be replaced by another one when a new mass killing is committed.Unlike a massacre by government forces three decades earlier in the city of Hama, which left more than 20,000 dead in just three weeks and still haunts the country, the reported atrocities have been spread over months of bloodshed in Syria. That has led some to call the government campaign a kind of slow-motion Hama…..
Police immediately moved in to disperse the unauthorized rally as up to 5,000 demonstrators flew banners in support of Syrian President Bashar Assad and called for the expulsion of the more than 80,000 Syrian refugees that have flooded into Turkey over the past 18 months. The protest reflects the increased polarization among Turks who are skeptical of their government’s confrontation with its Arab neighbor. The Hatay province borders Syria and somewhat mirrors its ethnic composition of Alawites, Turkish and Arab Sunni Muslims, and Christians. And many there have ethnic and religious ties to minorities in Syria and are distrustful of those who seek Assad’s ouster. Aerial attacks also have the advantage of depending on a part of the armed forces which is almost entirely controlled by Alawites, the sect to which the Assad family adheres. Mr Assad’s father, Hafez, ran the air force before he launched the coup that brought him to power in 1970. It is reasonably well equipped, with perhaps 325 aeroplanes that can be used for ground attack and 33 helicopter gunships, and its personnel are thought less prone to defection than army officers have proved…..
Sept. 13 (Bloomberg) — Syria’s central bank has foreign reserves that are enough for “years,” Prime Minister Wael Al- Halaqi told state television in remarks aired today. Al-Halaqi said rumors that Syria’s currency is weakening are “baseless.” He said the central bank has 600 billion Syrian pounds ($8.9 billion) in its coffers. Total of 34,000 emails leaked today from the Central Bank and the Ministry of Presidential Affairs. Allegations that foreign-born radical Islamist militants hailing from around the globe are streaming into Syria, are appearing with increasing regularity in media accounts of the conflict in Syria (al-Jazeera [Doha], August 23; al-Akhbar, July 26). Since the start of the uprising, influential radical Islamist ideologues as diverse as al-Qaeda leader Ayman al-Zawahiri, exiled Syrian Salafist cleric Sheikh Adnan al-Arour and Lebanon’s Dai al-Islam al-Shahhal have appealed to Muslims to travel to Syria to fight the Ba’athist regime (al-Arabiya [Dubai], February 12; Daily Star [Beirut], April 16). Al-Qaeda’s Iraq-based affiliate, the Islamic State of Iraq (ISI), and the Algeria-based al-Qaeda in the Islamic Maghreb (AQIM) have also interjected themselves into the campaign by publicly declaring their solidarity with the insurgency. AQIM commander Abu Musab Abd al-Wadoud (a.k.a. Abdelmalek Droukdel) issued a video statement in August lamenting the Algerian government’s position on the crisis in Syria and the predicament of Syrian refugees in Algeria (Al-Andalus Media Foundation, August 27) Abu Hussam al-Shami (a.k.a. Abd al-Aziz al-Kourkli), the commander of the Khilafah Brigades of Lebanon’s Fatah al-Islam militant group, was killed near Damascus earlier this month (OnlyLebanon.net [Beirut], September 8). …..
DOHA, Qatar — In recent weeks, the growing death toll in Syria pushed that country’s civil war to the top of the Obama administration’s agenda, with some Arab leaders pressing harder for a greater American role in toppling Syria’s leader, Bashar al-Assad…..
Will US aid keep Syria from becoming more religious and radical? Other fighters assert that the strength of the religious fighting groups here has more to do with the fact they appear to be better financed than other groups. “Many people join Ahrar al Sham and Jabhat al Nusra because they have money and weapons,” said one fighter who declined to be named with Suqqor al Sham, another rebel group fighting here. Syria’s policy on the sale of gas oil, or mazout, is again this year a source of all sorts of rumours and debates as the winter season nears. Syria’s national currency has lost some ground in recent days with the US dollar currently trading at around 72 pounds in black market dealings. I don’t know about crumble, however, the regime forces will be defeated by the FSA heroes. Syria will be liberated street by street. I was one of the Wikistrat analysts and have to admit I find the potential creation of an Alawitistan as a legitimate option to be pursued. A palace coup against Assad or even protection of a rump regime with most chemical weapons under its control would be better than a pure Lebanon scenario or a radical Sunni ascendancy in Syria. Dear Greg, Thanks for your comments. I wasn’t actually thinking about what would be better; rather, I was speculating about what seemed most likely given the balance of power on the ground today. I don’t think an Alawitistan could become official. No one would recognize it. 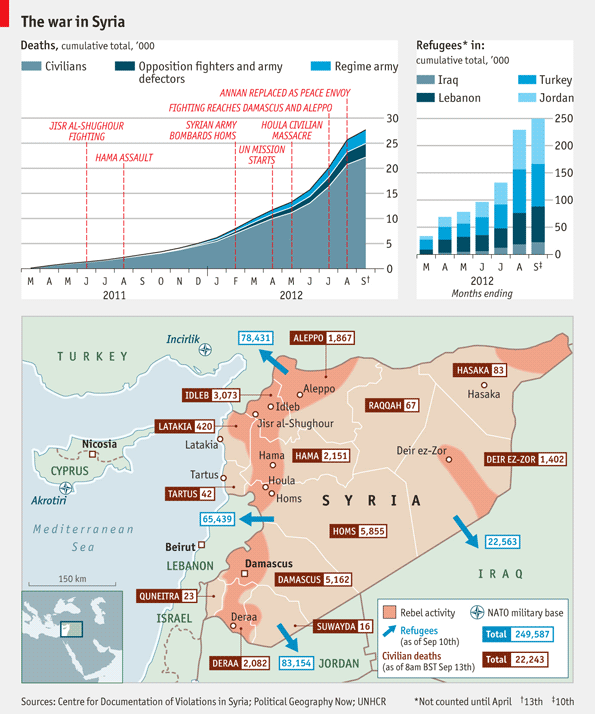 But the emergence of various militias in Syria will complicate future state-building. It seems unlikely that one militia will win any time soon by destroying the others or by subsuming them through persuasion. Years down the line, some sort of deal-making may bring forward a state and return stability to the country. It still remains too early to get a good picture of how the social forces in Syria will take shape. I think the movie about prophet Muhammad (PBUH) is being used by a lot of people to make a political statement, it is a spear that wants to kill an elephant or at least injure the elephant’s pride. people have the right to demonstrate but not to kill,destroy or burn. They can talk all they want. Nothing is going to be solved. The only solution is to isolate the foreign jihadi while arming the ingenious FSA to get the job done. THE international peace envoy for Syria, Lakhdar Brahimi, was to hold talks in Cairo last night with Arab League chief Nabil al-Arabi following his trip to Damascus. “Brahimi will brief Arabi on his visit to Syria and his meeting with Syrian President Bashar al-Assad and members of the opposition there,” an Arab League official said yesterday. The UN-Arab League envoy and Mr Arabi will discuss “the Arab and international moves required to resolve the current crisis in Syria,” the official said. The veteran Algerian diplomat, who left Damascus on Sunday, warned after a meeting with Assad that the worsening conflict in Syria threatens both the region and the world at large. “The crisis is dangerous and getting worse, and it is a threat to the Syrian people, the region and the world,” said Mr Brahimi, who replaced Kofi Annan following the failure of the former UN chief’s six-point peace plan. As Mr Brahimi left Damascus, a rebel commander who had an internet conference call with the envoy on Sunday said his mission was doomed to fail. Human Rights Watch says it has documented more than a dozen summary executions of prisoners. قال رئيس الوزراء التركي رجب طيب أردوغان إن القوات الامنية التركية قتلت نحو 500 من المتمردين الاكراد في عملياتها خلال شهر. واوضح أن بينهم 123 مسلحا قتلوا خلال الايام العشرة الماضية في مدينة هكاري جنوبي شرق تركيا. Please can you be more specific. Which institutions are no longer functioning? Any update from the FSA “commanders” about their occupation of 70% of Syria? Other than Tlass being groomed by his jet set Parisian sister as well as Hollande, what happened to Hijab and the other “high-level” defectors? Have they moved to “Bakkourland”? Foreign Minister Muallem accidentally fell out of a plane over Damascus. At the time the local rebels assumed it was a dud barrel bomb. It turns out he miraculously survived the fall. A final blow to the SNC? The birth of a western supported transition government in exile? Ryad Hijab to lead a new opposition group with military and political wings. High-level Syrian opposition sources told Al-Hayat that meetings between Syrian opposition forces, which have been taking place in the Jordanian capital of Amman for several days now, seek to unite and establish an overreaching framework to serve as a substitute for the Syrian National Council (SNC). This united front will be headed by the defected Syrian Prime Minister Riyad Hijab, who is currently in Amman. Yasser Abboud, commander of field operations for the Free Syrian Army (FSA), who is currently in Amman, said that “the opposition meetings in the Jordanian capital that were launched last week are still ongoing.” In an exclusive interview with Al-Hayat, he said, “The ongoing meetings include politicians and military officers who defected from the criminal regime in Syria, in addition to some SNC members, who have personally attended the meetings.” Abboud stressed that the military leaders represent various cities and villages of the Damascus and Daraa governorates, the latter of which borders Jordan. Abboud explained that the meetings seek to unify the ranks of the political and military opposition, and look into the possibility of establishing a political alternative to the SNC. Abboud, who is the leader of the group that succeeded in smuggling Hijab out of the country and into Jordan, said that “Hijab will be at the head of the new Syrian opposition entity, while defected Brig. Gen. Mohammed al-Hajj will head the FSA military and field leaderships, as well as the military and revolutionary councils. This new military entity, named the National Syrian Army, will be affiliated with the political leadership. However, Abdul Salam al-Bitar, the secretary-general of the SNC’s regional office in Jordan, criticized the meetings, saying that they “are run from abroad.” Bitar said that talk of unifying the opposition is a “big lie” which aims to declare an interim government “led by former regime leaders who killed so many Syrian people before they defected from the regime. Morsi’s regional contact group about Syria already failing? CAIRO (Reuters) – Saudi Arabia opted to stay away from a meeting of four regional powers on the Syrian crisis on Monday, adding to a sense that the forum is unlikely to advance the quest for peace. I hope none of our posters here consider Ar’our a real sheikh or a real opposition figure, the guy is a clown with a beard. Time for Aroor to know that he may be one of the reasons for lack of swift success of the Syrian revolution. I have not watched him on any TV channel but from what I have read here which could be just lies and propaganda, Arour should submit to a dementia test. Paulo Sérgio Pinheiro who chairs the International Commission of Inquiry for Syria, sees mercenaries as the most dangerous and scary element of the civil war going on in that Arab country. Speaking at the ongoing session of the Human Rights Council in Geneva Pinheiro said that some of the mercenaries were joining forces with the opposition, while others were setting up independent groups acting on their own. The mercenaries are exacerbating tensions in Syria and encouraging the opposition to radicalize, the diplomat said. You could be right that at a certain stage the regime forces might retreat from Damascus and fortify themselves on the coast. But once this is done, they would not be able to sustain their position for long. Allawis are 12% of the population at best and they would be unable to lose the revenue of the state and at the same time maintain balance of power with forces to whom they lost the battle for Damascus. He’s wrong. It’s both a revolution AND a jihad. God and revolution are not irreconcilable. Thank you for your words from the last post. I am sorry you have remained offended. My only wish really is for my fellow country men and women and children to live in freedom, dignity, and prosperity. I do want them to enjoy life to the fullest and to hope for a better day for their offspring. The obstacle remains a dictatorship that is bent on destroying the place. Dr. Landis the post today clearly shows that this is the plan B that Iran has for its presence close to Lebanon and to remain engaged in the region. For without Syria and with new Arab leadership assuming their rightful role of defending the land the people and the faith; the role of Iran will become marginal. After all they are Persians and Shia. Egypt now has depth with Libya and Tunisia behind it. KSA if it agrees to move forward and help Egypt will add significant weight ( despite my abhorence of the house of Saud ) this is reality today. WSJ had an important article today about the head of anti separatist movements having been dispatched to Syria from Iran, this coincides with the offensive against Rastan which will try to cut off the supply from Lebanon. It is possible that an Allawistan ( I like the designation ) will have close contact by land with northern Lebanon and this is where we have to see what happens on the other side of the border as the Syrian warplanes have bombed Lebanon today. Meanwhile, HA is trying to deflect from Samaha and this latest demonstration for the prophet is of course too little too late but hey we can use any distraction we can possible have, right? Now when France says we are not arming the opposition to me this is the same statement that the prime minister says that there are 600 billion pounds in reserve. This is half of what the regime had at the beginning and I think it is being pumped with printed money and with help from Iran. How many months of salaries does that cover and how many fuel imports does it cover? The WSJ says that the Iranians are forming the Allawi militia the so called Lijan Shaabia into a 50 000 force and they will insure the security of Allawistan. Is that enough? If they withdraw with chemical weapons to the mountains can they use them? If they use them can they escape retribution? If they withdraw they will need coastal access for without it they are economically dead; can they keep the coast clear of artillery fire? Again my question to Dr. Landis, is this a realistic survival strategy? In Lebanon there is enough of everyone to make everyone never achieve a full control, is it possible in Syria once the levers of power are no longer in the hands of the Allawis? What are the attached strings? Morsi following Erdogan’s aggressive attitude toward Syria? CAIRO—Turkey will provide a $2 billion aid package to help Egypt finance infrastructure projects and increase its dwindling foreign currency reserves, Egypt’s Minister of Finance said Saturday. Egyptian financial policy makers have embarked on an aggressive effort over the past several months to solicit foreign assistance and investment in the hopes of mending a gaping budget and foreign currency reserve deficit. The fact that the Syrian rebels have committed war crimes has been found and publicized repeatedly for anyone willing to hear it. In May, a United Nations investigation found that rebel militias were committing atrocities along with Syrian government forces. Again in August, the UN “identified both parties as guilty of war crimes.” Human rights organizations like Amnesty International, along with good, hard reporting have revealed a systematic practice among the rebel groups of murder, torture, and brutal massacres. Armed opposition groups have subjected detainees to ill-treatment and torture and committed extrajudicial or summary executions in Aleppo, Latakia, and Idlib, Human Rights Watch said today following a visit to Aleppo governorate. Torture and extrajudicial or summary executions of detainees in the context of an armed conflict are war crimes, and may constitute crimes against humanity if they are widespread and systematic…. Syria’s opposition has split over choosing a mediator to lead dialogue with the government officials, Russia’s deputy Foreign Minister Gennady Gatilov told reporters Monday. Watching the video, I conclude that Aroor does have dementia. He had difficulty remembering Samir’s name referring to him as Ahmad Nashar instead. His restlessness, motor agitation and lack of inhibition all support the diagnosis. Aroor does not represent me and does not represent the Syrian revolution. Shame on the TV station that is unwittingly helping the Syrian regime by broadcasting his show. Don’t you think many other minorities and moderate Sunnis will follow? Do you have this video with English subtitles? I guess you are realizing now what kind of man has been behind the rebels and how some Arab TVs have encouraged hatred, division and violence among Syrians. Sorry ! i have not ! Lebanon to call for an AL emergency meeting to discuss the film. Nasrallah urged the Lebanese government to act decisively. Shortly afterwards, Lebanese Foreign Minister Adnan Mansour told Reuters he had called Arab League Secretary-General Nabil El-Araby to ask him to organise an emergency meeting of Arab foreign ministers to discuss the film. Lebanon holds the rotating presidency of the Arab League’s Foreign Ministers’ Council. Aroor was not the catalyst that led to the revolution. It was the brutal oppressive and corrupt rule of the house of Assad that left Syrians no choice. External forces have indeed taken advantage of the situation and I do blame the sponsor of those TV channels for tainting this revolution with a religious brush. But let us be clear, this revolution was/ is not about minorities/ majority sectarian divide. It is a revolution of a nation in its quest for freedom and dignity against a family that stole the country. It has nothing to do with ‘freedom’ and ‘dignity’ anymore. I agree with Dr. Landis that the Syrian Army is unlikely to end in a rapid and total dissolution. I do believe, however, that Dr. Landis should revisit his position that an Alawite State would be untenable. An Alawite State would enjoy a buffer zone of Maronites, Nusairis, Ismailis, and Imami Shiites that would greatly complicate Sunni rebel attempts to seize operational-depth terrain. Given that Lakatia and Tartus have the sea to the west and 50 kilometers of mountains and favorable human geography to the east, the Alawites have significant strategic depth. Also in the Alawites favor is the large number of armored fighting vehicles inherited from the Syrian Army which would act as rapid reaction forces. The three thousand plus field artillery pieces would complement a multi-layered defense. A long, unsupported Sunni rebel infantry assault -even in superior ratios- across this terrain would be inevitably and hopelessly outclassed. You’re right. Thanks to the regime you can now add to them ‘self-defence’ and ‘justice’. Turkey wants all Syrians in Hatay who rented houses to go back and be restricted to refugees camps in order to avoid confrontations with the unsympathetic local Turkish populations. Turkey’s Foreign Ministry is looking to coax back upward of thousands of Syrian refugees to temporary camps in the country’s south as they remain unaccounted for elsewhere in Turkey, an official told the Hürriyet Daily News yesterday. “Syrians who crossed the border illegally or escaped from the camps have been invited to come back to the camps by the Foreign Ministry,” Suphi Atan, who has been appointed to coordinate the Syrian camps in southern Turkish cities, said in a phone interview yesterday. Atan said there were between 5,000 and 10,000 Syrians living in Hatay outside the camps, and there were thousands of others in other cities..
You are correct to ask this question. Assad cannot afford such a fighting force without the financing that comes from owning Syria. The only way he can sustain his military is if Iran chooses to fund him as it does Hizbullah, which it might well do. Question 2: Assad and the Alawis would not be able to defend against the 70% Sunni Arabs. But that statement presupposes that the Sunni Arabs will fight as one and will unify. There is no sign that they will. No winners in this bloody war,only victims. These words from the Holy Father are being lived right now by our fellow faithful in Syria. We have just received an urgent appeal from the Church there for emergency aid to help rescue 500 families from Homs who were forced to flee the violence and chaos now happening in their country. Terrified families fled with only the clothes on their backs—there was no time to pack food or medicine or even children’s toys. Right now, these 500 refugee families from Homs are seeking refuge in the Christian town of Marmarita, near the Lebanese border. The Church is their only hope. “Christians are in a desperate situation,” said His Beatitude Ignatius Joseph III, Patriarch of the Syrian Catholic Church. He is doing all he can to provide for these poor men, women and children, who are displaced and dejected, tired and terrified. But the need is great. Please help today. We have pledged $100,000 to help these families. بعد أن أعلنت جامعة الدول العربية عبر بيان رسمي عن إلغاء اللقاء الذي كان مقرراً أمس بين أمينها العام نبيل العربي والمبعوث الأممي إلى سورية الأخضر الإبراهيمي في مقر الجامعة، عقد اللقاء في مكان إقامة الإبراهيمي، الأمر الذي أعاده مصدر مسؤول لـ«الهروب من الإعلام». Ibrahimi also refused to meet Hamad at the latter’s place at Four Seasons so Hamad had to come to ibrahimi’s HQ then leave the meeting without a statement.KSA was a no show at the new Quartet meeting. As of now Ibrahimi earned the royal disapproval of Hamad and Abdullah,that is what i call a good start,but this also means that the three amigos: Hamad,Abdulllah and Erdogan will do what they can to abort ibrahimi’s mission unborn fetus. Is France friend or enemy of Islam?! UNITED NATIONS, September 14 — In the UN Security Council, statement are adopted by consensus, but some of what is said long rankles other diplomats. So it is with French Permanent Representative Gerard Araud. During a closed-door discussion this week of a draft press statement on the killing of US diplomats in Benghazi against a backdrop of protests of an anti-Islam film, Araud said, as paraphrased to Inner City Press by four Council diplomats, that he likes and takes pride in the freedom to denigrate religion. Another told Inner City Press, but then France should at least be consistent in being for free speech, because there are some kinds of speech they do not allow. We note that France has positioned itself with the opposition in Libya, particularly in Benghazi then air dropping weapons into the Nafusa mountains, and now in Syria, where even the founder of MSF from Paris has said half of the fighters he treated in Aleppo were, to put it diplomatically, armed opponents of such films. Is French policy in this regard schizophrenic? Or is it simply cynical? Menhebaks and sectarian opponents of the revolution, please explain to the world how this dialogue that you’ve been publicly calling for (while also cheering on the slaughter of thousands of Syrians) can take place when your regime keeps arresting the peaceful opposition members who have denounced foreign intervention and are willing to talk. If the regime can’t even talk to the opposition it created, how can it ever find a way to talk to Salafis and armed rebels, which, according to some genocide enthusiasts, constitute more than 50% of the population. If the regime can’t kill enough civilians and armed rebels to restore order, and it can’t figure out a political transition, then anyone who supports the regime or opposes the revolution is responsible for prolonging the conflict. Unless there is some other solution, where the regime doesn’t kill and imprison its opponents and the rebels shoot kisses from their rifles. That’s where the delusional live, a space that also attracts those in denial of their deep sectarian hatred. Check out these Assad supporters in Antakya. Lots of delusional, ignorant racists – one man threatened to kill the reporter. I would feel sorry for them (because they are poor and stupid) if they weren’t supporting pure evil for sectarian reasons. It is not that difficult to figure Syrian, most Christians and many Muslims I should add, left Syria after the 1950 because a moron by the name of Jamal Abdul-Nasser came to Syria and nationalized all industries, kicked non-Muslims from government offices and military and stole land that belonged to Christians and rich Sunni Muslims too. So many people were bankrupted overnight and he did this in Egypt also to bankrupt the Copts, FYI. They did not leave because of secularism, they were forced out and the Baath did not make things any better as a different gang took over. I hope this helps. Well this is one Antoine I really don’t mind listening to! It is the absence of fear that makes the revolution possible, if you don’t fear the present how do you fear the future, if you don’t fear the future then you can make change a reality. The biggest obstacle to the revolution is the fear of change, what will happen next? The big question! The answer is we don’t know, anything can happen, and when you understand anything means everything then you have a revolution! You may see a world full of conspiracies, but be fair all examples came from the second german tv station,( ZDF) which has a bad reputation when it comes to cover the news on the ME. I always assumed that they might just have one or two arabs working for them as freelancers, they do interprete wrongly and surely a video is labeled wrong. If thats part of a global conspiracy for you, you can indulge yourself! Letter of the Aleppo Syrian Orthodox bishop to the Pope, including details on the current situation. Three Wishes Addressed to His Holiness Pope Benedict XVI in the occasion of his historical visit to Lebanon and the issuing of the Post-Synodical Apostolic Exhortation. Aleppo, Friday 14 September 2012. Your timely historical visit to Lebanon is welcomed by all citizens, Christians and Muslims of Lebanon, Syria and the wider Middle East. The most important station of this visit is the issuance of the apostolic exhortation. Whose inception we saw two year ago at the special Synod for the Middle East in the Vatican. Christians in the Middle East at this juncture are eager for the success of the multidimensional facets of the apostolic visit: spiritual, religious and social. Aspiring that in the current state of fatigue, your presence in our midst will inject enthusiasm, assurance and your special message will envelope the good news of a bright future for the entire region. Your Holiness, here are my three wishes and concerns. For over a year, since mid March 2011 Syrians have been enduring an unprecedented and unfamiliar state of violence, following the initially peaceful popular uprising. The violence swiftly spread to rural and urban areas in different parts of the country, with a human toll of tens of thousands of victims and martyrs. Simultaneously, this created waves of exodus of hundred thousands of internally displaced and external migrations. We have suffered terrible human and economic losses in major cities of entire residential quarters, markets and commercial zones, vital public amenities and tens of thousand of missing people. No citizen is currently immune from the swiping swords of violence in major cities, like Dara’a, Homs, Idle, Damascus, and now Aleppo, which overnight became battlefields. Christians and Muslims in different villages, towns and cities faced forced displacement form their peaceful co-existence in their traditional living quarters to the destitution of refugee camps erected in Syria or on the borders of neighbouring countries. Aleppo, among other Syrian cities previously reflected a peaceful situation and an exemplary co-existence of a Christian stronghold in a Muslim milieu. Never before in its contemporary history, has the city of Aleppo witnessed such a painful and threateningly difficult time, like what we have been experiencing over the last few weeks. In Aleppo, Christians were kidnapped, viciously tortured, with hefty ransoms claimed beyond the economic capability of Syrian citizens and their extended families, were demanded for their release. Churches, mosques and other religious centers and institutions were targeted and sacrilege in Homs, Aleppo and other localities in Syria. What is more dangerously unsettling is the online circulation of threatening and intimidating statements and communiqués, that were initially, directed generally towards all Christians in the city of Aleppo and the second directed specifically towards the Armenian community. Lately this threat was translated in a fatal ambush of a group of Armenians returning from Armenia on their way back to Aleppo from the airport. All these incidences created a state of deep depression and anxiety for all Christians in Syria regardless of their denominations. Such absence of law and order will reflect badly on the well being of the entire community. The only measure of self protection and security available for the terrified and traumatized ordinary citizens is to leave their homes at the earliest possible opportunity and seek a refuge, wherever possible. They are mostly ending up in Lebanon, Egypt, Cyprus and Turkey. What aggravated and undermined the status of our presence and witness and encouraged Christians to embrace the idea of immigration. Is the fact that some Armenian families were granted Armenian passports in preparation for evacuation the prosperous Armenian community in Aleppo. Other people are using green cards and visa to different part of the world to immigrate. Consequently, we are facing a steady mass exodus. Until the last few months, immigration was not a priority let alone the only solution for the co-existence of Syrian Christian communities. Alas, as the situations intensified, violence escalated and the failure of different calls and endeavours for a cease fire and the restoration to the negotiating table. Consequently, now, a great many people are nursing the idea of immigration regardless of the destination. Sadly, they are desperately clutching on to rumours of possible immigration opportunities to Sweden, Holland, Canada or America. Accordingly, waves of families are leaving Syria to Lebanon in anticipation of finding an immigration avenue via the United Nations or any other humanitarian organisations. The entire situation in Syria and the immigration scenario is a mirror image of what happened to Christians from Iraq post 2003, many of whom are still refuges in Syria awaiting indefinitely for their ambiguous destiny. The mere thought of an action replay of what happen to Christians in Iraq is enough to send a chill down the spine of every Christian and Church leader in Syria. Heaven forbid, if the Iraqi predicament will be repeated in Syria. Its Christians will defiantly be diasporaised. This will reflect badly on the social fabric and the delicate balance of the demographic tapestry and debase the rich Syrian mosaic which has been the treasured Syrian identity for centuries. We urge world Churches and their leaders and world governments and their decision makers to endeavour to cure the root cause of this imposed violence which has accelerated the enforced migration of peaceful citizens of Syria. We wish they can return to their peaceful life and co-existence and enjoy again being productive citizen among the pluralism of Syria. Unifying the date of Easter. Establishing an anniversary for the Christian Martyrs. Activating Christian unity. Empowering and supporting Christian-Christian dialogue and Christian-Muslim dialogue in the region. Given the utmost importance to propagate the message of love and co-operation between them, emphasis on the importance of the Christian presence, the sustainability of Christians in the Middle East is an Islamic moral responsibility. It is pertinent for fellow Muslims to realize that citizenship is the only way which guarantees the equal rights of every one under the ceiling of Homeland. Implementing and adhering to the concept of citizenship is the duty of the government and legislative authority. It is not enough for Churches and its institution to condemn and denounce immigration. They should be instrumental in stemming migration, and formulating polices to empower and enable Christians to lead peaceful and dignified lives, by establishing and enhancing educational, cultural, medical and media institutions, housing projects for the youth to enable them to establish their new families and consolidate their presence and witness in their society. We call on Arabic and Islamic Governments to reconsider their education syllabuses and purge them of any signs or intimation which may encourages a culture of sectarianism, discrimination and violence against fellow citizens which undermine the role of Christians or any other groups in society, highlighting the fact that Christians are not new comers to the region. They are the indigenous people of the land before the advent of Islam, who have lived and practised Christianity in the region for two Millennia. It is not only useful but also important to address governments to put an end to the repression, arbitrary arrest, release and rehabilitate prisoners, establish a welfare systems to enable families of martyrs and forced immigrants to re-gather their shattered lives, give more freedom for the media, and implement the needed and overdue reforms, adopt democracy as a path to achieve equality and social justice. Also, to place the establishment of security, stabilities and peace in all Middle Eastern countries. Finally, I call to all belligerents factions to join the negotiating table and develop a code of conduct and honourable accord to establish just peace that re-secures life and tranquillity to all citizens. I wish Your apostolic visit all success and a blessing for the region. Apart from their role in the Middle East, Russia fears that a victory of Saudi and Qatari-sponsored jihadist groups in Syria could also have a negative impact on the situation in Russia´s North Caucasus, where “Wahhabi insurgency” is widespread, especially in regions as Chechnya and Dagestan. Mr Landis ! can you tell us what is the meaning of (Assad’s Army)? did you mean http://en.wikipedia.org/wiki/Syrian_Armed_Forces ? You acknowledge that it is the Syrian armed forces are strong and can answer in case of NATO aggression ! so you have no chance то get lost in cheap markets terminology ! He meant Assad Alawi militia, a better name, I propose “Assad’s phalange”. Iranian Foreign Minister Ali Akbar Salehi put forward a suggestion at a regional “contact group” meeting held in Cairo on Monday, that Egypt, Saudi Arabia and Turkey dispatch observers to Syria, the official news agency IRNA and broadcaster IRIB said. Ali Shari’ati did not live long enough to see the mullahs hijacking the revolution but his writings about religion and politics are rich material worthy of the finest universities. One can easily use his analysis to better understand the middle east today. يعتبر على شريعتى (1933-1977) عالما اجتماعيا متميزاً ومصلحاً رائداً ومفكراً متنوراً فى حركة الإصلاح الاجتماعى والدينى والسياسى فى إيران؛ من خلال دراسة مجتمعه وبيئته وأسباب التخلف والجمود والثقافات الدينية والعادات والطقوس المؤثرة على المجتمع. ومن أهم كتب شريعتى “التشيع العلوى والتشيع الصفوى”، و”النباهة والإستحمار”، “دين ضد الدين”، “العودة إلى الذات”، “معرفة الإسلام”. كان فيها محللاً ناقداً مفكراً، واضعاً يده على الجرح والداء. خصوصاً الكتاب الأول الذى هو عبارة عن محاضرات ناقدة فى حسينية إرشاد فى طهران، حيث نقد التشيع المعاصر معتبره تشيعاً صفوياً، وقد انحرف عن تشيع أهل البيت كليا منذ الدولة الصفوية (1501-1722) التى حكمت إيران والعراق وتحالف معها وعّاظ السلاطين والفقهاء وأجبرت المسلمين السنة على الانتقال للمذهب الشيعى بوسائل القوة والإجبار والاضطهاد، وعندها استعمل الصفويون الدين كعتلة لتحقيق أهدافهم السياسية ومواجهة الدولة العثمانية السنية. حار الكثير من الباحثين عن مذهب شريعتى، لكنه أجاب عن ذلك فى كتابه “دين ضد الدين”، وقال: “أنا سني المذهب، صوفي المشرب، بوذي ذو نزعة وجودية، شيوعي ذو نزعة دينية، مغترب ذو نزعة رجعية، واقعي ذو نزعة خيالية”. هكذا عبر عن نفسه ليجمع بين مذاهب متعددة لتكون الحقيقية جامعة متكاملة يكمّل بعضها بعضا. Shia Arabs who refuse to accept Wilayat Al-Faqeeh and have a reconciliatory philosophy are considered traitors by Safawee Shia and you see evidence of that from Lebanon to Iraq. Buddhism and Existentialism are not necessarily opposed to each other, as the quote above implies. And the former is definitely not a religion, though it is often slandered as such. This will be my last time addressing you, after this post you will cease to exist to me. I am not scared of you, or your kind. You are a coward and a traitor, old men like you that succumbed to Assad and his goons for forty years turned Syria from the paradise it was to the hell it is today. How do I know you are an old man? I can tell from your bitter posts, you have been humiliated and been a slave to Assad and his henchmen and then after that you gave up on my country, packed your bags and moved to Canada. Time is not on your side, time is on my side. I might be a brat, or baggage, or a dog that needs a leash, but I am not an old coward like you. In 10 or 20 years you will be six feet under, while I will enjoy drinking a bottle of Château Bargylus in a Free Syria ruled by a generation that sacrificed for its future, and saw Syria for the Paradise it is. Your generation will go down in Syrian history as the worst Syria has seen, no wonder you are filled with so much hate and despair. This is not your revolution old man, you had your time and your time is quickly fading. Tick tock tick tock tick tock….. I do appreciate your introducing to us the brilliant mind that is Mr Shari’ati, Ghufran, but don’t you think it hurts Mr Nabil al-Haidari’s feelings to find out that you do not mention him or direct people to his article? How would you feel if people did that to your intellectual efforts? Exclusive: French photo-journalist Mani meets Syrians from the town of Latamneh who are preparing suicide belts and bombs after two “massacres” which they say were carried out by government forces. He is perhaps 11 years old. He is one of the few survivors of a terrible massacre in the Syrian town of Latamneh, writes Jon Snow. He reels off the identities of some of the 26 members of his extended family who were wiped out systematically, at play, at work, and at home. The massacre was forensic. The reason was clear. A member of the boy’s family was a defector from Assad’s army. The French photo-journalist Mani went to Latamneh to piece together what happened. His film, which I report tonight, is bookended by children. The closing sequence depicts a desperate father, frustrated by the failures of the opposition, yet burning with anger against the Assad regime. The same man also complains of the numerous “foreign fighters” now engaging in Syria. They fear an influx of foreigners and they fear they will change the nature of this war. Will Iran be lured by Morsi in dumping Bashar Al Assad? Cairo is trying to convince Iran to drop its unquestioned support of Assad in exchange for help in easing Tehran’s regional isolation, officials close to the Egyptian presidency said last week. Morsi was said to have offered a package of incentives for Tehran, including the restoration of full diplomatic ties and efforts toward reconciliation with wealthy Gulf nations — a significant diplomatic prize for the Islamic Republic, especially as it comes under mounting pressure over its disputed nuclear program. Short time earlier I caught on TV the last 15 minutes of RT’s Spotlight with Mufti Hassoun as guest. Doesn’t look like it’s up (online) yet. I am glad that we are teaching math now on SC. Despite apparent harmony, there is a fierce underground war of influence between KSA and Qatar. During Egypt elections, Qatar has supported financially Egypt’s Moslem Brotherhood that KSA abhores. KSA’s candidate, close to Mobarak, was beaten and now condemned to jail. In the international arena, Qatar and Turkey are increasingly stealing the spotlight from the KSA as the leaders of the Sunni Moslems. To counteract that, KSA has been tolerating that rich Saudis support financially the Salafists therefore trying to undermine the Moslem Brotherhood, while not inclined to see them taking power. KSA has always preferred a non-competitive moderate president, even non Sunni, rather than a Moslem Brotherhood or a Salafist in all Arab countries. After the tragic events in Egypt, KSA has realized that the Salafist support has gone overboard and is threatening KSA’s allies. So it must rein that movement in Cairo and concentrate in creating troubles on the Sinai to continue weaken Morsi. As for participating actively in the ‘moslem ‘ quartet instigated by Morsi, KSA is undecided. It has heavy grudges against the three others. First it resents that Morsi has organized unilaterally that group, probably with little consultations with KSA. Secondly, under USA’s pressure, KSA is against having Iran out of isolation, something that Turkey and Egypt are working for. KSA (and the USA) sees with anxiety a rapprochement between Iran and Egypt that may influence the whole region in distancing from the USA. Thirdly, for Syria, KSA is against another Moslem Brotherhood government. It would rather see a moderate Sunni, or alternatively a strong Alawi presence in a new Syria’s government that would counter the Moslem Brotherhood influence. Overall KSA is confused in its foreign policy in the region and may well decide to cut down the financial help to the salafists in Syria, if they don’t see a moderate sunni moderate emerging as Syria next president. Ultimately they may tolerate Bashar Al Assad until the next elections. Strangely, they may align themselves with Iran, Russia and China on that matter. Anti-American protests that started in Cairo and spread across the Muslim world have stalled negotiations to provide crucial U.S. economic assistance to Egypt, U.S. officials said Monday. The violent demonstrations sparked by an anti-Islam video, and Egypt’s initially clumsy response, have temporarily halted talks about a proposed $1 billion in debt relief and how to speed millions in other aid to Egypt, according to several U.S. officials who spoke on the condition of anonymity because they were not authorized to speak to the news media. No new aid is likely to be approved for Egypt until after the U.S. presidential election, and talks aimed at breaking a logjam on spending funds already approved are on hold, the officials said. Several U.S. officials said that the delays are expected to be temporary and that there is no major reevaluation of U.S. aid to Egypt. “Folks are going to wait and see how things materialize both with the protests and on Capitol Hill,” a congressional aide said. Seventy-four years ago, in April 1928, a 20-year-old girl named Nazira Zayn al-Din wrote a controversial book titled, Unveiling and Veiling. The Muslim veil, she boldly stated, was un-Islamic. If a woman was forced to wear the veil by her father, husband or brother, Zayn al-Din argued, then she should take him to court. She added that men and woman should mix socially because this develops moral progress, and that both sexes should be educated in the same classrooms. Zayn al-Din compared the “veiled” Muslim world to the “unveiled” European one, saying the unveiled one was better because reason reigned, rather than religion. Her book caused a thunderstorm in Syria and Lebanon. It was an outrageous assault on traditional Islam, coming from Zayn al-Din, who was a Druze. Rather than get banned by government censors, the book went into a second edition within two months, and was translated into several languages. Great men from Islam, including the muftis of Beirut and Damascus, criticized her, but nobody accused her of treason or blasphemy. They accused her of bad vision resulting from bad education. NATO intervention seems increasingly unlikely, due to the sum of recent events. Without this, the FSAlafists have no chance of winning more than a slice of desert for their caliphate. Seems like we lost many of the rebel cheerleaders once the math code was implemented, hahaha. I think you are totally wrong about VISITOR. I do not think he is old, infact he is either a teenager or in his 20s, that seems most likely from his posts. And from reading his comments I think he is defintiely not the typre you mewntioned. i respect his type, they NEVER submitted to Assad and NEVER accepted this regime since March 8 , 1963, infact they oppose the very ideological foundations of this regime and other similar regimes, which makes me respect them and feel the future belongs to them. He and his type have always held their heads high, unlike you, who are physically afraid of the shabiha and the mukhabarat, nor do you have the courage to physically confront the shabbiha and mukhabarat. The only thing I dislike about VISITOR is he is too rude with some pro-revolution people as well, especially with you S.O.D ( I don’t mind rudeness with shabbiha). I hope rebels make Aleppo their final battle and spare Damascus unnecessary destruction. The outcome of Aleppo battle is uncertain to many,I see it taking longer than what both parties thought, but it will still end with the withdrawal of rebels after inflicting enough punitive damage on a city that refused to rise. from following social media outlets,one can easily see the hatred some have against Aleppo and the increasing anger among Aleppines towards the rebels who brought their fire to a city that did not ask for it. FSA coming soon to Nabatieh and Sour and Bint Jbeil, after taking over the Assadist dump called Jabal Mohsen. I have posted this before but the regime thugs still don’t have the answer…. On 4th September a high-ranking regime officer in Aleppo claimed that the regime Army will be able to capture Saif al-Dawla by the next 2 days and the whole of Aleppo within 10 days, it is 18th September today and even Saif al-Dawla is mostly still the frontline. Even Saif al Dawla has not been captured by the regime. What do the regime supporters have to say about this ? Do you think the Islamist terrorists have defeated the Syrian Army ? What can be more shameful for the strongest Army in the Arab world, with 400,000 active duty troops and 700,000 reservists and 5,000 Tanks, to be not able to take abck a few neighborhoods and suburbs from Islamist terrorists for 2 months ? So is it a FAILUREE for the regime and the Army ? Why don’t they throw in the towel ? Don’t they have any honor left ? Just the FACT that the regime is nowhere close to defeating the rebels should be a cause for Assad to throw in the towel. Since I have been asking this question for the kast 5 days and not a single Menhiback has had the bal*s to answer, I ‘ll go on and say that if I was the Syrian Army chief I would have either resigned and thrown in the towel, at the humiliation for not having been able to defeat a small-time militia. Loool, half a million Salafists in north Lebanon have not been able to “take” Jabal Mohsen (30.000 people or so) for more than three decades. I severely doubt the ragtag FSA can eliminate what Israel couldn’t in south Lebanon. How can they take anything outside Syria, when they can barely take anything inside? The biggest threat against the Syrian Salafists are their own hubris and stupidity. They’ll end up like the pathetic Chechens or UCK. All I have to say is that they’re keeping their promises better than the FSA’s constant “the regime will fall in weeks”, lol. Most Syrian activists and fighters do not trust the MB, but the vision and ideology of Sayyid Qutb still has many takers. You should not forget to say, 40,000 Syrian troops were in Lebanon during those 3 decades. Al-Qaeda’s branch in North Africa praised the recent killing of a US envoy in Libya and called for more attacks on US diplomats to protest an amateur US-made film mocking the Prophet Mohammed. Al-Qaeda in the Land of the Islamic Maghreb also threatened attacks in Algeria, Tunisia, Morocco and Mauritania, while condemning America for “lying to Muslims for more than 10 years by saying its war was against terrorism and not Islam.” The Yemen-based branch of the terrorist organization has also recently issued calls for attacks. HABIB, the Syrian Army which took over Beirut in 1 day hasn’t been able to conquer their own city – Aleppo in 2 months, what does that tell you about the FSA. Btw what happened to the Bab Salama and Bab al Hawa and Alboukamal border crossings, the green-whote-red flag of the FSA is still flying in these corssings, your Assad Army of eunuchs is so pathetic, they should all be castrated. We have not seen this level of incompetence in a professional Army against a rag-tag insurgency since the days of Vietnam. Today, with the rise of Islamists to power, or influence, in Egypt, Tunisia, Yemen, and Iran, the world is faced with another ideology, Islamism, a comparatively modern term. There are two ultimate aims of this ideology. One is to restore wherever possible the first system of government set up in Islam in the 7th century — the Muslim Caliphate — by uniting Muslim nations either through political action or by force, as the Muslim ruler applies and enforces the holy law of Islam. The second is to have people convert to Islam, or to have them, in the religions of Christianity and Judaism, submit to Islamic rule. It is not always easy to distinguish between Islamism, supposedly the ideology of an active minority, and the religion of Islam. In Bernard Lewis’s words, Islam “is not only a religion in the narrow Western sense but a whole civilization which grew up under the aegis of that religion.” In contrast to the Westphalian system of a secular state sovereignty, Islam has a political identity and allegiance transcending all others. Sovereignty, or supreme power, belongs to Allah. In practice that power rests in the ruler who acts on the basis of Sharia, or Islamic, law. It is an open, though important, question whether the essence of, and interpretation of, the political identity of Islam is the call for jihad [“struggle,” and the common name for holy war], a key element of the Muslim faith. MOSCOW, September 17 (Itar-Tass) —— Russia’s Deputy Foreign Minister Gennady Gatilov does not believe that the UN Security Council is paralyzed and unable to make a decision on Syria. “The claims the UN Security Council is paralyzed and is unable to make a decision on Syria are fundamentally wrong,” he said. He called upon the UN Secretary-General, Ban Ki-moon, who earlier claimed the Security Council was in a state of paralysis, to proceed from more balanced positions, the more so, since acute such issues were on the agenda. As he dwelt on the mission of the UN/LAS special envoy Lahdar Brahimi, Gatilov remarked that it was a delicate and complicated one. He voiced the hope that in his work the envoy would stick to the principle of continuity, support the Annan plan and the Geneva communiqu·. “We have maintained regular contacts with Brahimi, including telephone conversations,” Gatilov said. He is scheduled to meet with Brahimi on the sidelines of the UN General Assembly in New York. How do you explain the years since 2005? It tells me that the FSA has a larger quantity of men than whoever was in Beirut, that keep pouring through the Turkish border. It is not a matter of the FSA being strong, the Syrian army can play whack a mole with them forever. The FSA won’t “take” anything. They have quantity over quality, that’s for sure. “A matter of weeks’ has shown to be 52 weeks or more. Foreign ministers of the regional “contact group” on Syria agreed at talks in Cairo to hold more consultations in New York later this month, the official MENA news agency reported on Tuesday. The top diplomats of Egypt, Turkey and Iran met in Cairo to discuss developments in conflict-stricken Syria, but Saudi Arabia, which is also a member of the group, was notably absent from the meeting. The ministers agreed to “hold their next meeting in New York on the sidelines of the UN General Assembly later this month,” MENA reported. Among the proposals put forward at the talks, Iran is suggesting it, Egypt, Saudi Arabia and Turkey dispatch observers to Syria in an effort to quell the violence there, Iranian state media reported. Foreign Minister Ali Akbar Salehi also offered to host the group’s next meeting in Tehran, the official news agency IRNA and broadcaster IRIB said. Salehi told his Egyptian and Turkish counterparts in Cairo that “observers” from their countries, and from Saudi Arabia, could “monitor the process of stopping the violence in Syria,” according to IRNA. The chair of the Russian parliamentary committee for foreign affairs warned that the fall of Bashar Al-Assad in Syria would lead to a second Iraq, with Muslim extremists inevitably seizing power. There are no guarantees that whoever replaced Assad would not immediately turn their guns against the United States, even though the Washington is actively aiding rebel forces, Pushkov said. He cited the current situation in Libya as an example, claiming that Libyans showed no gratitude for America’s role in the overthrow of the Muammar Gaddafi regime. “Yes, from Libya to Syria the insurgents can demand support, weapons, money, a ground invasion and air force operations from the United States, they are ready to use all this to seize the power in the country, but the majority, if not the absolute majority of population in these countries have no good feelings whatsoever towards the US,” he wrote. He went on to explain that US officials mistook their connection with the small group that came to power in post-Gaddafi Libya for the backing of the country’s people. Those relationships have further frayed, with many Libyan families losing family members in US and NATO military actions, the Russian MP said. The parliamentarian also accused the West of a double standard in protecting activists and artists who attack Islam, as happened with the American-made film ‘Innocence of Muslims’ that recently sparked widespread protests and violence in the Muslim world. “This has nothing to do with freedom of speech. The freedom of speech is not covering a lot of other things that are considered banned in the West. Otherwise they would not be so eager in attempts to put Julian Assange in jail,” Pushkov said. “Attacks on Islam and its sacred things – this is not the freedom of speech but the freedom of hatred,” he wrote. The regimes strategy is Shock & Awe, right? In a few weeks they’ll report that Bashar himself has defected too. Hafez? He defected in 2000. The war between the PKK and the Turkish army is now a major concern for Turkey and a potential source for future hostilities between Turkey and Syria if no political settlement is reached between the Syrian regime and its opponents. لا تزال كرة الثلج صغيرة ! على الأتراك أن يسبقوا الزمن و الا ستكبر كرة الثلج عندهم و لا عودة الى الخلف ! …and soon that Uzair8 defected and went to join the Talibans in the mountains of his country where there is internet. An increasing number of “foreign elements” including jihadist are operating in Syria, an independent U.N. panel confirmed yesterday in its first report to say that outside “terrorists” have joined a war spiraling out of control. The investigative panel appointed by the Human Rights Council said some of these forces are joining armed anti-government groups while others are operating on their own. “Such elements tend to push anti-government fighters towards more radical positions,” the head of the panel, Brazilian diplomat and Professor Paulo Sergio Pinheiro, told diplomats. He referred to the foreigners as “terrorists,” though the word did not appear in the written report, according to the Associated Press. The clock is ticking for Turkey faster that it ticks for Bashar al Assad. The refugees continue to pour in Turkey and are increasingly unwelcomed, restless and costly as winter approaches. In addition if the PKK war escalates, Turkey may face a wave of terrorists acts in the main cities that may cripple its tourism and discourage its investors. Erdogan is under a strong pressure to find a way out of this quagmire without loosing his face. Will Lakdar Ibrahimi or the Moslem “contact group” show the way out? Shower of stones welcome Lakdar Ibrahimi in Jordan refugees camps. In Jordan, Syrian refugees at a Jordanian camp pelted the U.N.-Arab envoy Lakhdar Brahimi’s convoy with stones during a protest over the international community’s failure to stop the bloodshed. Considering the fact that the U.S. and western Europe control most UN organizations, I suspect that reports like the one you posted, along with other recent reports about war crimes by oppostion forces, may indicate a shift in the U.S and European attitude toward events in Syria. I think the recent anti U.S. protests in the “liberated countries” may have finally awaken them. I think it is very clear. Now its the turn of the opposition to be threatened of prosecution for war crimes. In my view it is part of the pressure being put on them by the UN to change their uncompromising attitude and force them to cooperate with the UN to reach a ceasefire and a deal before it is too late for them. The number of activists behind bars has reached 216,000 (11/9/12) according to one of the committees (Darayya) keeping track.